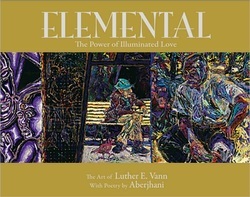 ELEMENTAL, the Power of Illuminated Love is an exuberant book that is almost “over the top” in the way it combines explosions of creativity with quiet expressions of spirituality. The pages showcase full-color reproductions of paintings by a modern master paired with the writings of a celebrated author and make up the kind of book that has been long treasured among those with a strong appreciation for exceptional art and inspiring literature. The paintings and sculpture are those of Luther E. Vann, whose works are part of the Telfair Museum of Art’s permanent collection. The poetry and the bulk of essays are by the award-winning author known as Aberjhani, frequently acclaimed for his works in different literary categories, including fiction, history, and journalism. In total, more than 60 brilliant works fill the book in several sections that begin with revealing interpretations of the art and continue with ekphrastic poems that do not necessarily describe the paintings but seem to flow from their essence. They confront such issues as modern warfare, overcoming personal tragedy, living love at heights approaching inner ecstasy, and remaining true to one’s sense of personal destiny. ELEMENTAL is based largely on Vann’s visual art and the book explores it as a means to strive for and sustain the highest levels of creative industry. Because the challenge is such a daunting one, the pictures are not always “pretty” in the traditional sense of the term. The poetry and prose reflect the need to claim both the “ugliness” in a life as well as its “beauty” in order to produce creative works of meaningful significance. Perhaps the highest praise anyone can make for this book that citizens of Savannah, Georgia, felt so strongly about that they pushed for its publication and made it happen is that it is true to the soul of its creators and therefore an authentic gift to the collective soul of the world. Reading those words, I could not say “WOW!” loud enough, not only because they chimed so beautifully with truth but because they armed me with a new perspective on a problem I’d been wrestling with in regard to one of my books: ELEMENTAL The Power of Illuminated Love. I am tremendously grateful for the opportunity to have published award-winning works of historical writings, fiction, and journalism, but ELEMENTAL occupies a very place among these works because it started out in 1991 as a literary underdog and then finally emerged on May 29, 2008, as a people’s choice champion. 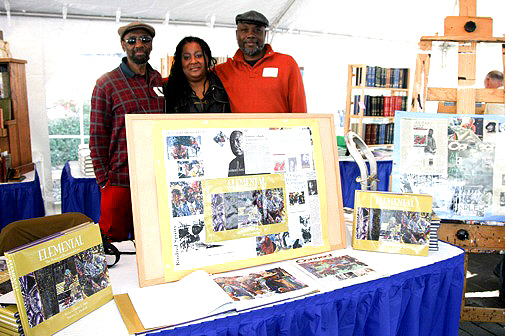 It was made available after almost two decades when supporters of the arts in Savannah, Georgia, via the Telfair Museum of Art and the Friends of African-American art, raised funds to publish the now celebrated gift book. The problem stemmed from the fact that the book was published via unconventional means that fell into the category of neither traditional publishing nor self-publishing. Consequently, it was left after publication without a system in place for its continuous distribution. As you can imagine, after years of working with ELEMENTAL’s co-creator, artist Luther E. Vann, to develop the title and finally see it released into the world amidst celebrations and honors, the clogged wheel of insufficient marketing was a huge bummer. The marketing and distribution of a book––or a DVD, CD, or fashion line––is exactly what Zafón’s character had described: “a simple and inevitable problem.” That’s why traditional publishers have time-tested distribution channels well in place long before the first page of a book is even printed. Because I had published my most influential works, like Encyclopedia of the Harlem Renaissance, through traditional publishers, and had not self-published ELEMENTAL, I was unprepared for the challenges and consequences ahead. Following a period of a month or two after its publication, I realized something was very wrong sales-wise and the problem was not going to correct itself. That was when I had to step out of both my “box” of conventional thinking where the publishing industry is concerned, and out of my comfort zone where 21st century authorship is concerned. Like most authors and editors, I prefer the creative literary side of the publishing business to the creative business side of it. But once I admitted to myself the uselessness of that attitude for those of us who have yet to sell two or three million copies of our works, I realized that my problem also represented an extraordinary opportunity. It was an opportunity to draw on and update my old skills as a bookseller, which I had not utilized in any major way for years since leaving the field to become a full-time caregiver and author. It was a chance to home-school myself on modern strategies for marketing books both online and off. Learning to set up social network profiles, design product pages, and track the impact of my own efforts––while compassionate millennials looked on to make sure I did it right–– proved as emotionally gratifying as it did professionally rewarding. And, possibly more than anything else, it provided an opportunity to personally ensure the cultural and financial results I desired, as well as the levels of discourse that readers worldwide deserved. This was, after all, a project that meant much more to me, and to many others, than just one more listing in a prestigious catalog. Whereas I had started out trembling before a problem with soul-numbing frustration and despair, one short bold step outside the box helped me to meet it head-on with invigorating enthusiasm, a more informed awareness, and, perhaps the greatest prize of all: renewed creative energy. Although it is a lesson worth learning at the most prestigious business conferences around, it was one I unexpectedly discovered and gladly accepted lifted from entertaining pages of literary excellence. ​Reviewed by Miriam Center6/24/2008The beautiful book graces the coffee table my living room, which displays on its walls other great artists I have known and admired. My life is enriched and surrounded by beauty of colors and words by Luther and AberjhaniReviewed by M. B.9/27/2005Oh goody, another masterpiece to add to my growing Soulsinger collection. I reiterate Nordette's review, especially since the last two books I've read of yours, The Encyclopedia of HR and The Wisdom of WEB DuBois, both, are integral contributions to accurately documenting the history and growth of Black America specifically and its influence on American culture in general. I have no doubt, in turn, ELEMENTAL will also be an integral contribution to the cultural and Arts communities throughout the world. This is not to mention my anticipation in reading your poetry which always inspires me to higher creative visions. I am off to order my copy. I have long, long been an Aberjhani fan. I came across his work many years ago online, as is more often now the case for many of us—to make our literary discoveries over the Internet. Yet how soothing, reassuring, to know that with all the changes and progressions and regressions of time and technology, some things hold true: art awakens and joins. No matter what the venue. Whatever our life experience, whatever our particular and individual view on the world around us, art illuminates and connects us. Art, one might argue, really is just the expression of love. Just as limitless, just as boundless, just as astounding. And then this gift arrives, this grand and pleasingly heavy book. Unwrapping, I knew this would not be the kind of read that one zips through on a spare weekend hour. "Elemental: The Power of Illuminated Love" is the kind of book one places carefully on the coffee table, inviting visit after visit after visit, over time creating a bond. In some 140 pages, on thick, glossy paper that bring sensual pleasure in turning them for new discoveries, I found not only the expected poetry of Aberjhani, but also more than 60 vibrant art reproductions by artist, Luther E. Vann. Now, this was new to me. I relished the additional discovery. Even as I read the lush work of the poet, the corresponding reproductions reflected the words in yet another medium. The artist Vann works in paint that resembles colored fire—the kind that one knocks one’s head back to gaze upon in the night sky on Independence Day. Fireworks, nearly liquid fire, in every blazing color and few of them muted, but pure, in shivering and shimmering lines. On closer inspection, I learned the artist sometimes uses chopsticks to paint instead of conventional brushes. Ah, I thought, that explains it. I could envision the chopsticks dancing across the black canvas—for Vann’s work is always on a black canvas—and could imagine the sparks that traced their dancing path. Both artists, the painter and the poet, are from Savannah, Georgia. Various essays in the book describe the meeting of the two, pleasingly drawing a circle at the conclusion. In the first meeting, Aberjhani writes his poetry to correspond with Vann’s art. By conclusion, Vann’s art comes to life in illustrating Aberjhani’s poetry. Art breeds art, life gives life. Vann has also spent time in New York City, and it seems his artwork reflects this, too: the beat and pulse of the great metropolis, the life that is born of the street, the milling of color as it blends and separates and blends again. His work is at times like neon on canvas, bright lights, and has, too, a dream quality, perhaps because of the ever present black background, reminding one of those mysterious dreams that haunt throughout the day. His paintings are often crowded with figures that intermingle and overlap, seem born of one another, yet remain distinctly alone. Aberjhani is also known as author of "Encyclopedia of the Harlem Renaissance," "The Bridge of Silver Wings," and "The Wisdom of W.E.B. Dubois." He publishes often in various publications, print and online. His poetry has an intensely intimate courage, the sort we would all wish to have, but too often hold protectively back. heave-ho of flesh awakens to higher intention. builds metallic agonies of nerve and thought. Joy like a forty-day flood of acrylic roses. The two artists are a perfect match, words as vibrant as image, image as emblazoned with fiery color as poetry. The occasional essay enlightens as to the inner workings of each, building anticipation for the pages ahead and beckoning return to the pages behind. into a single small space. and the main reason I was born. of a vision still hot with truth. I return to this book time after time, as one does to art—for inspiration, for a reminder of what is still hot with truth.